Learning about habitats? 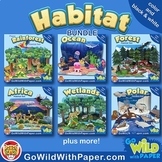 This is a perfect, hands on project to help students learn about different habitats. Included in this file is the project directions, pictures of examples, and a grading rubric. These projects come out great and the kids love them! 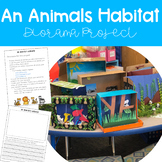 A project guide for students to create a diorama in a shoe box for an animal's habitat. The instruction sheet, animal information sheet, and grading guide are included in this document. This 4 habitat diorama is everything you will need to have a fabulous culminating project on the ocean, desert, forest, and arctic. You can do this project at the end of your unit, or piece by piece as you are studying each habitat. Includes directions and student examples. Enjoy! 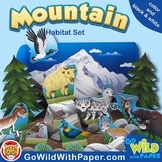 These are guidelines and a rubric for creating a habitat diorama. I send these pages home and give the children several weeks to research create their project. The children use the rubric to make sure they are including everything necessary and I use it as a grading tool while they are presenting. Have students practice research skills and then use their creativity to design an ocean habitiat that includes plants and animals that live in that habitat. This product includes project instructions, suggested groups, and a rubric for grading. It is also able to edited to meet your specific needs. 2 projects in one-students create a diorama of a chosen habitat and complete a report on it. Then students can create a mystery animal to live in their habitat. Explaining adaptations the animal has in order to survive in the habitat. This project follows a unit on habitats. Correlates with common core standards for science and speaking/listening. Packet includes 4 planning pages, parent letter, scoring rubric.